Detects and measures depth of LNAPL and DNAPL. 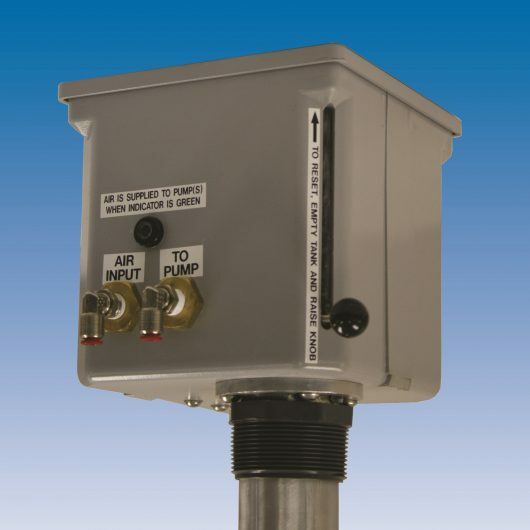 Measures the thickness of floating or sinking products in monitoring wells or storage tanks. 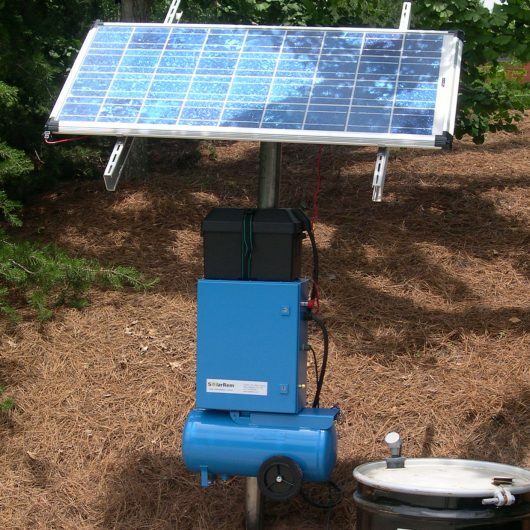 Detects the presence of water in storage tanks. 7/16 or 5/8 in probe for use in small wells. Field proven for use in small (½ in I.D.) wells. 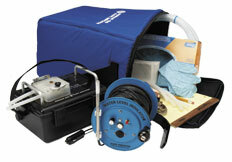 Product/Water Interface Probe (front) and optional carrying bag (rear, TR-925). Raising the standard for performance and reliability. Designed to keep working despite normal wear and tear. The "smart" electronics will tolerate severe scratches and condensation which reduces the need to replace the prism or lens. Sensitivity Control. Get quick readings and prevent false positives of water or hydrocarbons. Superior resolution and accuracy. The tape is marked in 1/100 ft or 1 mm graduations. Proven and rugged optical sensor. 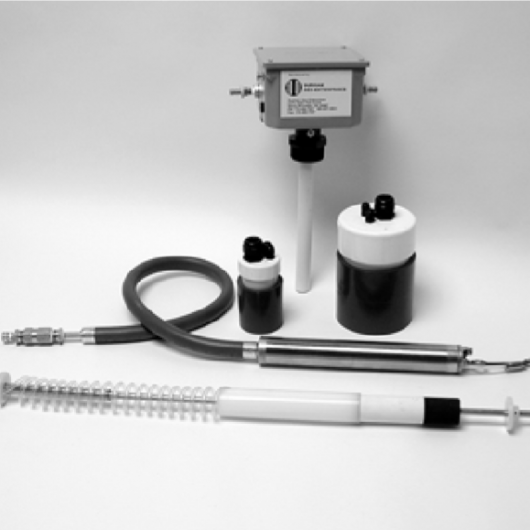 Two separate sensitivity controls for the water sensing and fluid sensing circuits allow the user complete control over the performance of the instrument. 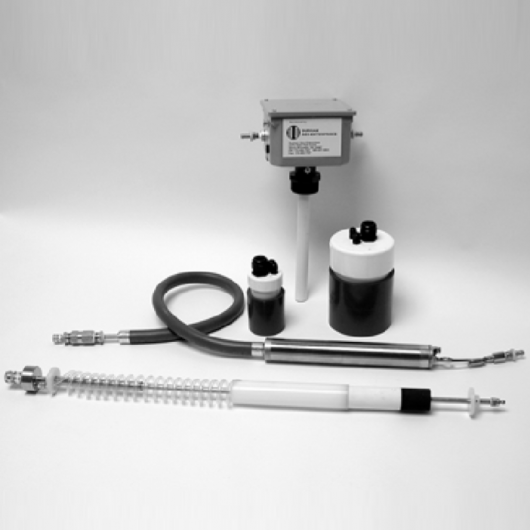 Measure LNAPLs and DNAPLs with a pressure proof stainless steel probe. Automatic Sleep function. Unit powers down after 10 minutes to protect battery life. 10-year limited warranty on all components plus a lifetime warranty on the reel. Field tested. Based on our popular Rugged Reel and tape with accuracy, durability and ease of use. Tapes meet or exceed federal specification US GGG-T-106E (U.S.A.) or EEC CLASS II (Europe) for a guaranteed accuracy of 0.008%. Note: Because viscous oils may adhere to the probe we suggest passing the probe through the product layer and record your readings while retrieving the probe. A solid tone indicates water. An intermittent tone indicates hydrocarbons. A brightly flashing green light near the battery indicates is the unit is powered. If the light is faint, the unit will detect product but will not detect water. The unit needs an alkaline battery producing 4.8 V to detect water.